Ellie Mae was so severely underweight when she was taken to N.E.G.A. Shelter the staff wasn’t sure if she could be saved. Her sweet personality encouraged them to give her a chance and she flourished with their care. As weeks went by and no opportunities for a home came Ellie’s way, it was apparent the dog had run out of time at the shelter. The Hart County Humane Society is happy to continue the rescuing of Ellie Mae and give her “meant- to- be” family more time to find her. 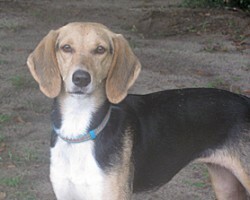 Ellie is an approximately four year old female Walker Hound. Her adoption fee covers her spaying, micro chipping, negative heart worm test, up to date vaccinations, parasite treatment and preventative. Ellie Mae is house trained, walks well on a leash and gets along with other dogs, cats, and people of all ages. She is a bit timid with new people until she knows she can trust them. We are sure her past was unhappy and want her future to be with a patient family who will love her. If you would like to meet this very special girl please call 706-436-0965 or email [email protected]. The Hart County Humane Society is a volunteer rescue organization. We receive no funding from any government agencies or other groups. We are a 501C3 non-profit organization. Donations are desperately needed to fund our foster/rescue and spay/neuter programs. Donations can be mailed to P.O. BOX 1062 Hartwell Georgia 30643 or be made online through pay pal at harthumane.org. Please help us help the animals in our community.